The city is planning to build two giant parking garages in downtown — instead of prioritizing affordable housing and green modes of transit. In 2012, the Oakland City Council adopted its so-called Energy and Climate Action Plan — the city's detailed blueprint for achieving a 36 percent reduction in greenhouse gas emissions by 2020. As part of that plan, the city established a goal of decreasing car miles driven by residents, workers, and visitors by 20 percent each year. The city, according to the blueprint, would discourage driving by making it easier for people to walk, bike, and use mass transit and by supporting dense development near public transportation so that more residents can live without cars. But while Oakland has made strides with some of those objectives, a new proposal for a mixed-use Uptown project next to BART sheds light on the ways in which the city's planning process is still stuck in the 20th century and has not fully embraced the Energy and Climate Action Plan, transportation advocates say. The proposed mixed-use project, known as the Fox Grand Residence, calls for the construction of a new, city-run public parking structure and an apartment building with a giant garage that will accommodate car owners in every unit, even though it's located at 18th Street and San Pablo Avenue, just two blocks away from the 19th Street BART station. With the large new public garage and the accompanying parking structure for residents, the 1800 San Pablo Avenue plan would encourage visitors to drive to the area and incentivize all tenants in the building to own cars — despite the fact that the project is located in one of the most transit-accessible neighborhoods in the Bay Area. Activists said they were especially frustrated with the project's car-culture features given that it's located on a city-owned site on which officials should be prioritizing forward-thinking projects — instead of wasting valuable land on space for car storage. "I would highly question whether it's a good use of public resources to subsidize parking," said Liz Brisson, a transportation planner who lives a few blocks away from the project and is co-founder of the advocacy group Transport Oakland. "Is this [garage] the thing that is going to benefit the most people?" 1800 San Pablo would bring new housing, retail, and car parking to Uptown. The large project, which has just begun the lengthy planning and review process and has yet to go before the Oakland Planning Commission, is a proposal of Sunfield Development, designed by architecture firm JRDV Urban International. According to Sunfield's Sid Afshar, the project is targeted to include 204 residential units (a mix of one-bedrooms and two-bedrooms), a residential parking garage with 204 spaces (one per unit), and 15,700 square feet of retail space. The project — located on a vacant site currently used as a surface parking lot — would also feature a separate 129-space public parking garage that the city would own and operate. Afshar said he intends to make 10 to 15 percent of the units affordable housing with the rest market-rate apartments. In interviews, Afshar and city officials said the large amount of parking in the project was necessary to accommodate drivers who want to live in and visit Uptown. But transportation activists and experts argue that the number of parking spaces is excessive for a downtown urban center and that the financial resources and land that the project intends to use for parking should instead be used for community benefits or to make housing more affordable. Critics also argued that if Oakland wants to promote alternative modes of transit, reduce greenhouse gas emissions, and achieve its climate change blueprint, city officials need to deliberately limit the supply of parking in areas where driving is no longer necessary. In recent years, East Bay transportation advocates have argued that cities' outdated, car-oriented zoning policies have forced developers to construct unnecessarily large garages in new apartment buildings. Because it's so expensive to build these parking spots — by some estimates, it costs roughly $50,000 to construct a single space in a structured garage — developers end up passing the costs along to tenants, and, as a result, build less affordable housing (see "A Green Solution to Oakland's Housing Crisis," 8/5). Oakland's current zoning rules require developers in most neighborhoods to build at least one parking space per unit in new apartment buildings. Developers can construct less parking only when they seek a formal exemption and make a case for why a smaller garage is feasible. As a result, developers tend to build more parking than needed, which is evidenced by high vacancy rates in the parking garages of Oakland buildings, according to research conducted by the Oakland-based advocacy group TransForm. 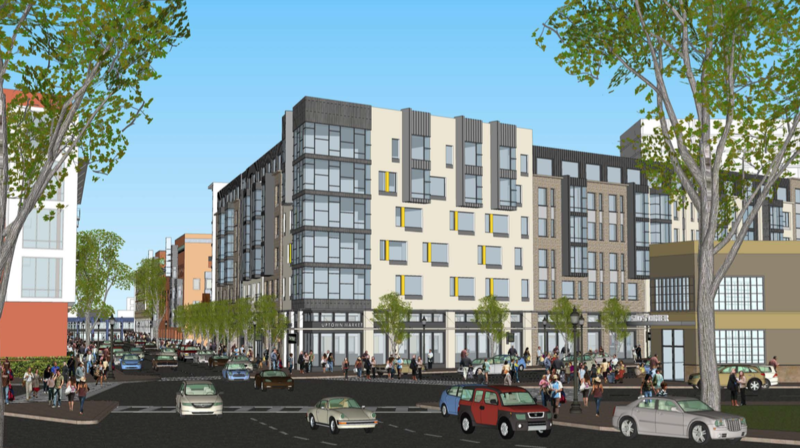 The 1800 San Pablo proposal to build 209 parking spaces for 209 units — the standard one-to-one ratio in Oakland — is inappropriate for a downtown project adjacent to BART, according to TransForm. That group runs a program called GreenTRIP, which encourages developers to build less parking and instead invest in more affordable housing or amenities that promote alternative transportation, such as free car-share memberships and transit passes for tenants. "For most people, the reason they want to live in Uptown is because they don't own a car," said Jean Long, GreenTRIP planner with TransForm. "They are thinking, 'I can take BART to San Francisco for work. I can walk to restaurants and bars.' You want to encourage pedestrian activity and biking. But when you build parking, you induce driving." TransForm recommends that buildings in downtown corridors construct no more than 0.5 parking spaces per unit. Based on rough estimates of parking construction costs, for the Fox Grand Residence, a residential garage half the size of the proposed one could allow the developer to spend at least $5 million less on parking. The project could then use those savings to increase the number of affordable units or provide features for tenants that make the building more attractive to those who don't own cars (such as an on-site bicycling fix-it station). But Afshar emphasized the importance of accommodating a large number of cars — describing a vision for downtown that activists say is not environmentally sustainable. "Downtown always needs more car parking," he argued. "It's not like Europe. ... We are still one car per family." He added: "We encourage everyone to take BART. We are very close to public transportation. However, there is something to be said about the privacy of driving your car after work. ... Not every place is accessible by BART." Afshar also noted that the city's parking requirements are stringent and that his project is simply following official municipal policies. It's true that his plan is not unique in Oakland. A number of residential projects currently in the works or recently completed throughout the city plan to build or have built about one space per unit. Notably, a recently proposed 33-story high-rise building on 19th Street and Broadway, directly above the BART station, is on track to construct 333 parking spaces for 345 residential units. That developer, Seth Hamalian, told me that lenders and investors are often reluctant to support a project that does not provide the conventional amount of parking, but added that as his project moves forward, he hopes to reduce the number of spaces. What is more unique about the 1800 San Pablo site is the fact that the city is proposing to use prime real estate so close to BART to create more car parking. 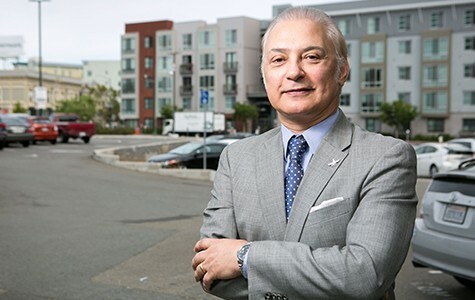 But Afshar contended that there is a strong need for a public garage at this location: "With the future development that is coming ... to Uptown Oakland, all the entertainment and restaurants, you can never have too many parking spaces." Patrick Lane, development manager for the city, noted that visitors to the nearby Fox Theater can struggle to find a spot at night. "There is really a heavy demand for parking in that area," he said. Lane also said that the city is not creating new parking, but rather replacing parking that was lost from the closure last year of the nearby Sears building on Broadway (and parking the city will lose when the 1800 San Pablo lot is developed). In addition to 1800 San Pablo, the city plans to run two new public garages nearby — one at 21st Street and Telegraph Avenue and another at 23rd and Valdez streets, Lane said. These garages are also designed to replace parking that the city is losing from new development. Between the three new public garages, the city will be providing roughly seven hundred spaces — which Lane said is significantly fewer spaces than previously existed in the area. "We just want to make sure the neighborhood continues to have available parking," he said. Activists, however, argued that this is a deeply flawed approach. Instead of aiming to accommodate existing or future driving needs — and reflexively responding to traditional neighborhood concerns about a lack of parking — the city should work to better utilize the existing supply of spaces. For example, the city could publicize downtown parking that is currently underutilized while also lowering meter rates or garage fees of those often-vacant spaces to incentivize drivers to use them. The city is, in fact, in the process of doing a detailed study of parking conditions in downtown, and transportation advocates believe the research will demonstrate that the area does not need new public parking (since studies have shown that perceptions of parking shortages often don't match reality). The city is also now rewriting its parking policies for new developments to make it much easier for residential projects — especially those located near transit — to build fewer than one space per unit. Mayor Libby Schaaf has supported reduced parking requirements for new buildings, and her transportation policy director, Matt Nichols, told me that constructing one parking space per unit in a development this close to BART does not seem appropriate. Projects near BART should include bike parking, public transit passes, and other features that enable the developer to build less parking, he said. "It should be thoughtful and site-specific." (Nichols, however, declined to comment on the proposal for a public garage). Regardless of the city's ongoing efforts to change residential parking requirements, advocates noted that for 1800 San Pablo — an increasingly rare opportunity to develop a vacant lot next to BART — any parking reforms from the city may be too late.